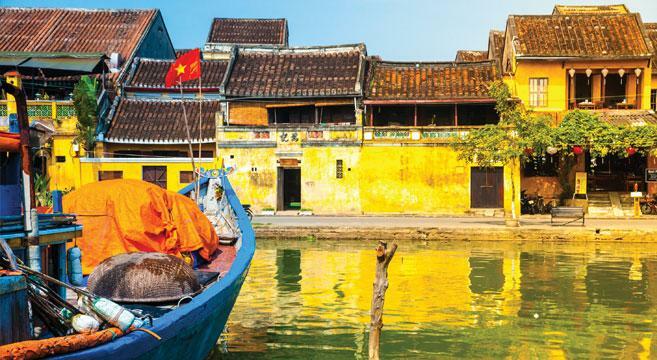 We are delighted to offer a brand new escorted tour to Vietnam. The itinerary includes all the highlights of this extraordinary country, and our expert local guide ensures that you also get to meet the people. This is a once-in-a-lifetime trip! Each group is accompanied throughout by a local Friendship Travel Host, who meets you on arrival in Vietnam. As well as local transport by road and boat, we include two internal flights. 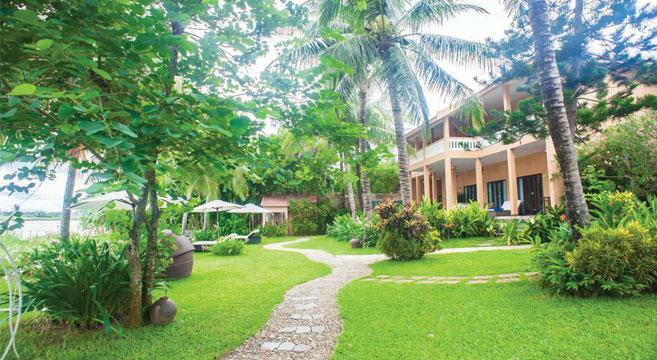 Our hotels are of international 4-star standard and we are on a B&B basis. Some other meals are included on excursions, and when they are not, we shall eat together (at own expense) picking local restaurants: allow £10-£15 per day to cover this, as well as drinks. The Aphrodite is a unique cruise. The small ships combine traditional craftsmanship with modern features. Vietnamese styling, smiling service, good food and amazing experiences are included. We may not have the ship to ourselves, but with only 17 cabins this is an intimate cruise. Day 2 - Arrive at Ho Chi Minh City (Saigon). 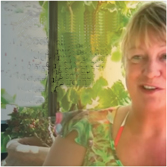 Meet your Host and transfer to the hotel (3 nights). The rest of the day is free to unpack, unwind and orientate. Day 3 - We drive south into Ben Tre province, boarding a boat to discover the Mekong Delta, travelling along palm-fringed creeks to see life lived on the water. Lunch included. Day 4 - A full day city sightseeing taking in Reunification Palace and the War Museum, Notre Dame Cathedral and Ben Thanh Market. After lunch (included) we visit the Cu Chi Tunnels where the Viet Minh resisted the French. Day 5 - Early start for our first flight, to Hue. The rest of the day you’re free to relax (2 nights). 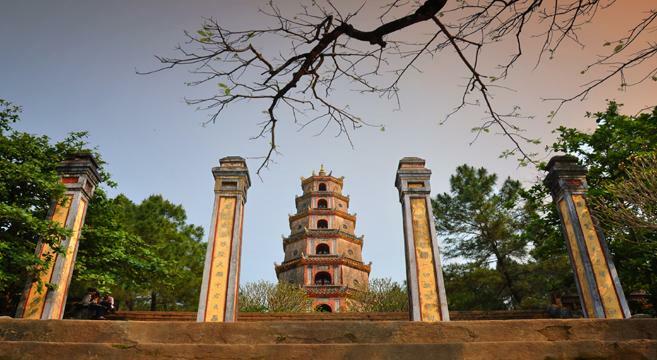 Day 6 - We take a boat trip on the Perfume River, visiting the Thien Mu Pagoda and the tombs of the emperors. After lunch (included), we see the local Dong Ba market and take a cyclo tour of Hue. Day 7 - Driving to Hoi An (for a 3-night stay), stop en route at the Cham Museum in Danang. In Hoi An town we visit the Covered Bridge, Assembly Hall and local market. Lunch included. Day 8 - This morning we visit the amazing temple site at My Son, which is a UNESCO World Heritage site. Day 9 - At this stage, we deserve a day off! Relax on Hoi An’s beach or explore the town. Day 10 - Fly to Hanoi (1 night). 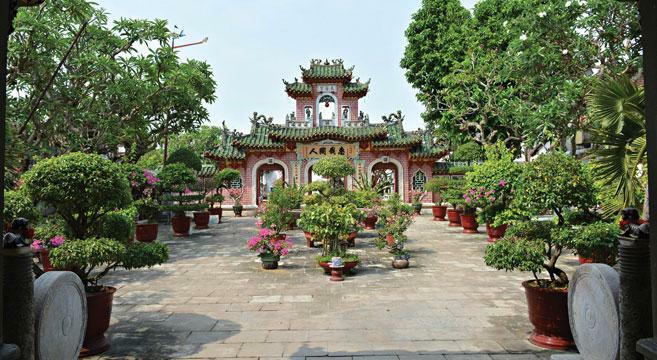 We take a city tour, see the house and mausoleum of Ho Chi Minh himself and the city’s pagodas. After lunch (included) we take a cyclo tour of the old town and see a performance of the famous water-puppets. Day 11 - The final highlight is beautiful Ha Long Bay. Board the Aphrodite for a two-night cruise, enjoying lunch as we set sail. Docking near the village of Cu Van, we take a sampan tour before dinner and late night squid fishing! Day 13 - Try Tai Chi before breakfast! There’s a final expedition, then we sail back to Ha Long Bay, enjoying lunch on-board before returning to Hanoi for a last night in Vietnam. Let’s make it a memorable one! Day 14 - After breakfast, time for last-minute shopping before the flight home. Day 15 - Land at Heathrow around breakfast time. The hotels are of international 4-star standard and we are on B&B basis. Some other meals are included on excursions in the towns, and when they are not we shall eat together (at own expense) picking local restaurants: allow £10-£15 per day to cover this as well as drinks. 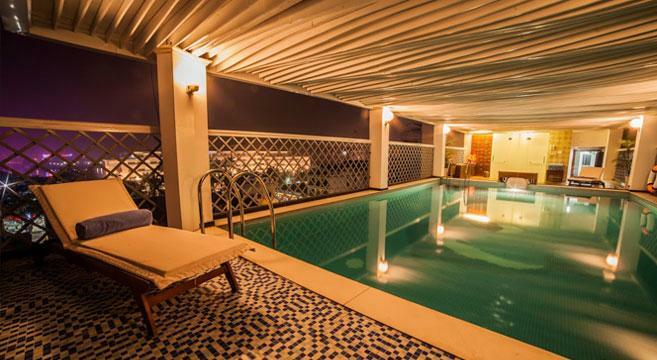 Ho Chi Minh City: Paragon Hotel Great central location for sightseeing, with good facilities for relaxing: outdoor pool, spa, sauna, bar and restaurant. Hue: Moonlight Hotel Downtown location within a walk of the Huong River. A luxurious hotel with an outdoor pool. Hoi An: Vinh Hung Riverside Resort Beside the Thu Bon River, this lovely resort is set in gardens within walking distance of the old town. Hanoi: Mercure Hotel La Gare A calm oasis in the city, in a good spot for the National Museum and for shopping! 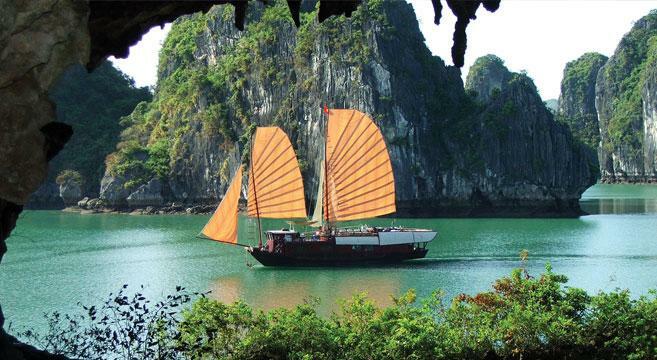 Aphrodite Cruise Ship - This luxurious small ship has 17 cabins, elegantly designed after ancient Vietnamese theme. 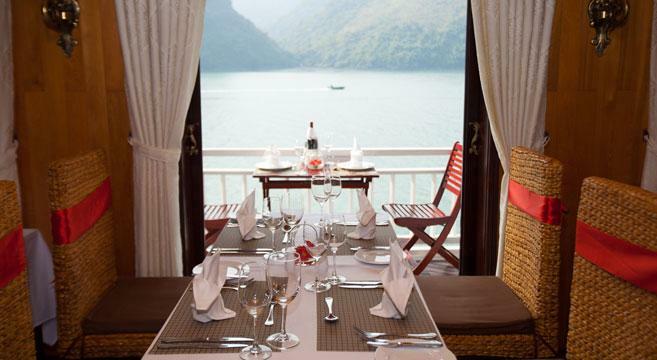 Each cabin has private bathroom, LCD TV, air-conditioning and minibar, to ensure the highest comfort and satisfaction during your cruise among Ha Long Bay’s thousands of towering islands topped by rainforest. We are delighted to return to Asia with a new escorted tour. Vietnam is an exciting mix of cultures, of landscapes and of people, and our two-week trip includes the best highlights of North and South, of city and countryside, and of past and present. Vietnam is only 50kms across its narrowest point yet stretches 650kms from its southernmost tip in the Gulf of Thailand to its northern border with China. We certainly cover a lot of ground on this trip, but we keep time on the road to the minimum by including two internal flights and we include a two-night cruise on Halong Bay, one of the most beautiful places on earth! Down the centuries, Vietnam has come under many different influences, while its recent history has been graphically portrayed in films such as Apocalypse Now and Platoon. It is only 40 years since North and South united, yet in this short time the country has transformed itself. 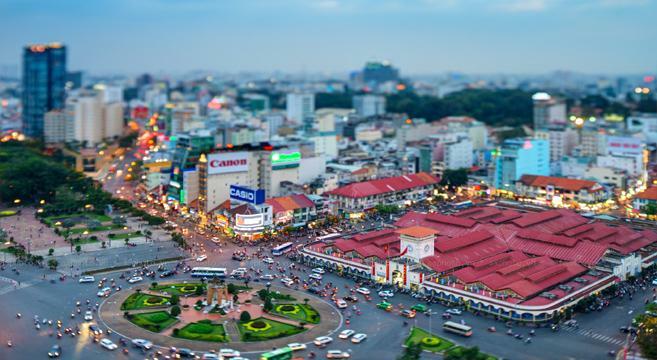 We start our tour in Ho Chi Minh City – Saigon – which buzzes by day and night, so we will explore its colourful streets and neon night life and get our first taste of Vietnam’s famous cuisine before heading into the Mekong Delta to see the south’s traditional side: houses on stilts and floating markets. 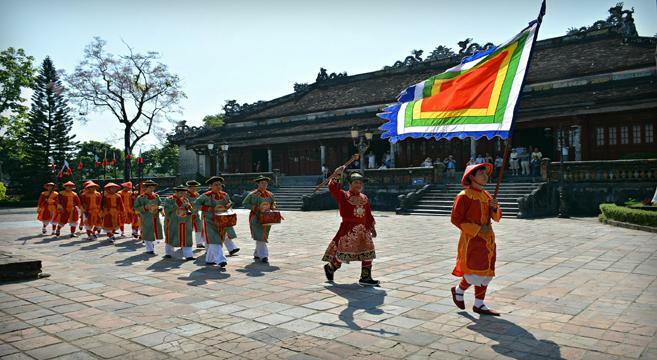 From here, we fly north to the imperial city of Hué and sail along the Perfume River. From here, we hit the road to discover the picturesque Harbour of Hoi An and the temples at My Son. 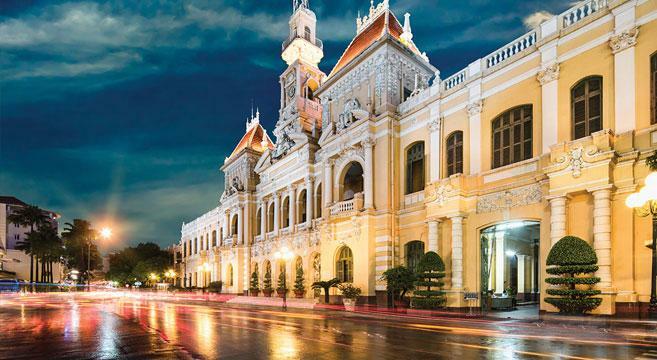 Then it’s another flight, to the capital of Hanoi, where we stroll along tree-lined boulevards with a French feel to discover the markets, art galleries and coffee shops of the old town, and see a ‘water puppet’ performance in one of the traditional theatres. After that we take to the water for a unique small-ship cruising experience. Truly, the stunning waterscape of Halong Bay makes for a memorable end to our tour, sailing among the limestone islands to discover hidden caves and secret lagoons. What a trip! All rooms are of 4 star standard, comfortable and all will have an ensuite. A visa, currently $30 per person, is payable on arrival. Bring 4 passport size photos with you for this. Your passport MUST have 6 months validity beyond the date of your return.